A report, released by the Institute of Medicine on Wednesday, says there are steps women can take to reduce their risk of getting breast cancer that is associated with environmental exposures. The IOM says there are several environmental factors that can increase a woman's chance of getting breast cancer. 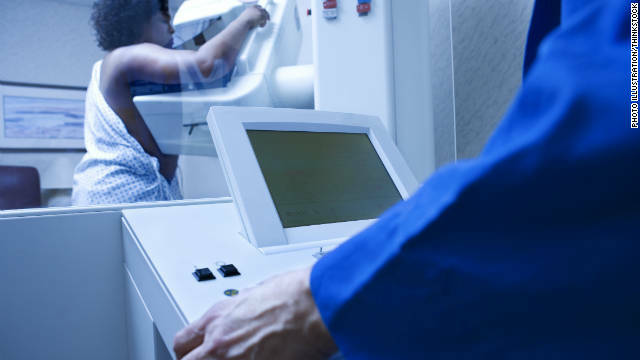 According to the report, "Breast Cancer and the Environment," exposure to ionizing radiation (that's radiation associated with diagnostic tests such as mammograms, X-rays and CT-scans) is one such environmental factor. Others include combination estrogen-progestin hormone therapy, oral contraceptives and weight gain - especially after menopause. Limiting alcohol consumption and not smoking, staying physically active and avoiding weight gain also help reduce the risk, the study found. When researchers talk about environmental factors, they are referring to anything that is not related to inherited DNA. It is less clear how exposures in the workplace to things like gas fumes and car exhaust, or chemicals found in things like benzene (a solvent used to make lubricants, dyes, detergents and pesticides) or ethylene oxide, a chemical used in antifreeze, adhesives and even cosmetics add to the risk of getting breast cancer. The committee found that because there is such little testing on chemicals in cosmetics, dietary supplements and other products before they actually go to market, they were unable to draw conclusions as to whether minimizing exposure to these chemicals is actually beneficial. The committee stressed more research is needed on environmental exposures over the course of a lifetime, with special attention paid to various stages of breast development, as well as cumulative and multiple exposures at different life stages, including in the womb. "Breast cancer develops over many years, so we need better ways to study exposures throughout women's lives, including when they are very young," said committee chair Irva Hertz-Picciotto, a professor in the department of public health sciences at the University of California, Davis, School of Medicine. "We also need improved methods to test for agents that may be contributing to breast cancer risk and to explore the effects of combined exposures." The IOM says the jury is still out on whether chemicals like bisphenol A (BPA), a chemical used in plastics to make them more flexible, contribute to a woman's risk of getting this type of cancer, but multiple studies found no link between breast cancer and hair dyes, or radiation emitted by cell phones and other electronic devices. "This is an important report that carefully reviews the evidence of how women can reduce their risk of breast cancer," says Dr. Michael Thun, vice president emeritus in epidemiology for the American Cancer Society. "There is accumulating evidence that active smoking in childhood and adolescence also increases breast cancer risk." According to the American Cancer Society about 230,500 women in the United States have been diagnosed with invasive breast cancer this year. Nearly 40,000 women are expected to die this from this cancer this year. Only lung cancer causes more cancer deaths in women. Susan G. Komen for the Cure commissioned the study. KomenPresident, Elizabeth Thompson, said the foundation, which has invested nearly $2 billion in finding a cure for breast cancer, will start a fund to work on initiatives addressing breast cancer and environmental links. "Understanding the role that environmental factors play in the development of breast cancer is hugely complex and IOM has done a good job laying out the challenges," Thompson said. "We intend to use these findings to guide our decisions about research to fund so that women and their families have the best science to guide them in making important lifestyle choices. We believe our efforts going forward will be made even more effective through the guidance provided by this study." Next entry »Should nuns be on the pill? i'm almost 24 years old and i've been on the pill for about a year and a half. breast cancer runs in my mother's side of the family – it claimed my great grandmother and my aunt. this article has horrified me to the point where i feel like going off the pill is not an option. The pill is dangerous for a woman in my mind.Use the thicker rubbers. I was on the pill when I was diagnosed with breast cancer at age 26. I was told to immediately stop taking the pill that same day by my surgeon who gave me the horrible news because she said the pill was making my cancer worse. My cancer was feeding off the estrogen and progesterone in my body and the pill added to that. The pill does increase your risk of breast cancer, but when you stop taking it your risk goes down to the same level as a woman who is not on it. There have been many studies on the pill and breast cancer. Only you and your GYN can make the right decision for you though. PLEASE stop taking this........As a breast cancer survivor who endured 6 months of chemo and 30 days of radiation – it is NOT as easy as some think – its a horrible procedure to go thru.......so PLEASE find another form of birth control!!!! Sorry about losing your mom. I lost my mom creently to the same disease. She wasn't as lucky as your mom, though, in how long she survived. Your mom must have been quite a fighter. That makes the biggest difference in holding on to life. It's very different for each person. This article says absolutely nothing new. 6 monthe later they did another ultra sound and 5 more mammograms! I was promised the results in "a couple of days" and 3 and a half weeks later I still don't know anything. Does anyone else regard 21 mammograms within 6 months a health hazard??????? YES1 You have to be educated before you do things to yourself. If it doesn't run in your family. Do your self exams. Of course most cases of breast cancer are caused by exposure to chemicals, specifically xenoestrogens. We are literally bombarded with these chemicals, and people need to make conscious decisions to avoid exposure. The parabens are the worst, and they are in nearly every body care product available. We are slowly poisoning ourselves, and by the time long term studies are complete, many lives will be lost. Be smart about what you put on and in your body. For example; I took my tween to have his hair cut, the woman wanted to put some gel on him.... well whats in the gel? Toxic chemicals of course! Then she went to put some powder on his neck.... well, whats in the powder? Toxic talc of course! Yes xenohormones are in almost everything! Ladies, take note ALL AIR FRESHENERS give off xenohormones. Don't use them if you don't want exposure, including the Febreeze they want you to practically huff! Don't use scented candles unless they are soy based and non toxic. All these glade gadgets that spit toxic fumes into the air are toxic to you, your children, and your pets! Do your research on xenohormones, it just might save your life! I don't see anything in the original report regarding birth control pills as increasing your risk of getting breast cancer after menopause...perhaps the author incorrectly wrote this? Besides most birth control formulations are progestin-only and it is the estrogen component that have the stimulatory effect on breast and ovarian tissue. Totally unhelpful article...we've known these things for years and years. Take the time to watch Keeping A Breast, a talk on what can be done to prevent breast cancer – it might just change your life! Thanks for posting; this is well worth the time it takes to listen to it. This information should be taught in schools and printed in women's magazines year after year, but you never see it in the mainstream. Most women know to get their mammogram every year, but don't know the first thing about prevention. I like that this physician has all of the statistics to back up the information. This is very, very helpful! Great video. My husband and I have been following a lot of what you recommend and we feel great. I had not been feeling all that great for a while. I used to get sick at least 2 or 3 times every winter, lasting for weeks at a time. I, also, thought I was starting to have strong peri-menopausal symptoms. Having a close relative with breast cancer, I decided to look for a doctor that dealt with bio-identical hormones. I found one and had some tests performed. Turns out I had a very low vitamin D level and my thyroid was off too. I was started on a therapeutic level of vitamin D and Synthroid. What a difference this has been in my life. I have not been sick for 2 years now. I barely get a sniffle. Everyone should get their vitamin D levels checked. I tell this to everyone I meet. I only wish that I could take something more natural other than Synthroid. Again, great video. I am going to make my family watch this soon. sweet! more tunes. I am one lazy batasrd when it comes to fillin up my MP3 player. Thanks for making it easy. I feel I should reciprocate with beer.